I've been so swamped with work-related reading lately, I've barely had time to read for pleasure. 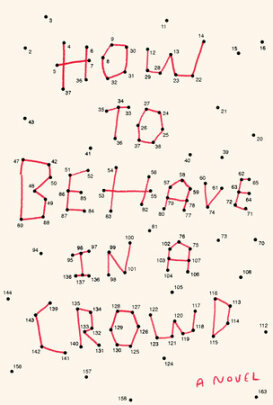 Thus, rather than my usual tendency to binge-read a book in one or a few sittings, I started Camille Bordas's How to Behave in a Crowd a few pages at a time. It took me a while to get into the story, but before long, I was sucked in — to the point where I was sneaking in pages on my way to work and before appointments. The protagonist Dory (or Izzie, as he prefers to be called) is the youngest of a large, Salinger-esque family of brilliant intellectuals. Unlike his pretentious siblings (who are sometimes hard to distinguish from one another), Dory is a kid with normal problems — loneliness, everyday humiliations, crushes on unattainable girls who may or may not know his name. Dory's normalcy makes him stand out from his siblings, who skipped grades at school and are prone to impart their wisdom to their naive younger brother in the most heavy-handed ways. We're told (and we see) that Dory is sensitive and empathetic in a way foreign to his siblings; he, for example, befriends his insufferably snobbish sister Simone's visiting penpal, Rose, because Simone can't bear to stoop to Rose's vacuousness. He pays attention to his loved ones and is frequently the only person to notice others' secret pain. At first, Dory's sensitivity seems like a weak consolation for the fact that he's not brilliant. But then we see that perhaps Dory's gift of emotional intelligence makes him the most brilliant of all. I really enjoyed this book. I loved Dory. I found his and his family's navigation through various events such as death, disillusionment, and failure compelling and real. While I never quite warmed up to Dory's siblings (until very literally the end of the book), the family's home was a place I liked to be, stained couch and all. I was sad to say goodbye (to Dory, not the couch). The beauty of this book is that things happen (big things! ), but it's not about the plot. It's a psychological bildungsroman in which a character's inner life is even more fascinating than what's happening around him. I received this book from Blogging for Books in exchange for this review. All opinions are my own. Hag-Seed by Margaret Atwood is a modern retelling of William Shakespeare's The Tempest, which I have not read. I worried that might make this review unfair, but then I realized there's got to be a good number of Margaret Atwood fans (or fans of literary fiction in general) who might be interested in Hag-Seed but also haven't read The Tempest. If you belong in that category, this review is for you. First of all, I don't think you have to be familiar with The Tempest to enjoy Hag-Seed. Atwood includes a plot synopsis of the play, but at the back of the book — I took this to mean she also doesn't think you need to know the original story to enjoy Hag-Seed. That said, I can imagine that familiarity with the original story would be helpful. But I'll get back to that later. Here's the basic plot of Hag-Seed: Felix is a play director who finds himself ousted from his position. He subsequently flees from all aspects of his previous life and holes up in a cave-like dwelling out in the middle of nowhere. For work, he secures a position as a teacher at a correctional center, with the condition that he be allowed to base the curriculum on a study and performance of a Shakespearean play. Meanwhile, he is dealing with his own demons — the grief of a past tragedy, the spite towards his ousters, his desire for revenge. All of this culminates in Felix's decision to have his inmate students perform The Tempest, both as a way to exorcize his demons and as a vehicle for revenge. To return to a previous point — you don't have to have read The Tempest to enjoy this book, but I'm willing to bet the story would be a lot more enjoyable if you had. There are plot contrivances that are understandable only because I know Atwood was following the original story. The characters are a bit uneven — the prisoners, particularly, seemed less believable as actual contemporary criminals than as background players in a Shakespearean comedy. I can, however, imagine the delight I would've experienced in connecting Atwood's story and characters with the original. I have always loved Atwood and there are certainly moments that shine for the writing. I particularly admired the sympathetic and believable depiction of Felix's relationship with his deceased daughter's ghost. But what I enjoyed most is the depiction of Felix's classes. As an English teacher, it tickled me to see a skilled teacher tease meaning and intrigue out of a Shakespearean work, especially since I will be teaching Shakespeare for the first time this year. Would that I be half as inspiring as Felix! I wasn't terribly interested in reading this book, based on the subject matter alone — it's about a wealthy, WASP-y family (with five sons who refer to themselves as — and I quote — the "Five Famous, Fierce, Forceful, Faithful, Fabled, Fortunate, Fearless Falkeses" — that moniker alone made me want to put the book down). We've established that an inordinate percentage of lauded "literature" revolves around the trials and tribulations of privileged white men and frankly, at this point, I'm just tired. The thought of reading about SIX privileged white men (the Five... Falkes + their dad) made me feel really tired. But — but! — I decided to give the book a shot and, lo and behold, I was rapidly hooked, despite myself. Rieger writes with spare — even brusque — sentences and the pace leaves no time for weariness. After the first few pages (in which we immediately discover that patriarch Rupert Falkes is dying, and then get a high-speed account of his blue-blood wife Eleanor's back story) I found myself thinking, "She's just telling us everything, straight up! How in the world is Rieger going to keep this up for 254 pages?" But she does! We soon find ourselves immersed in the kinds of conflicts rich people encounter, like a posthumous paternity claim, unrequited love, mid-life crises, anti-Semitic in-laws (almost all of which can be solved by $$$). To me, the magic of the book is that I loved reading it, even though I didn't truly care about anyone's problems, and that's simply a credit to Rieger's clever writing. I love her way of taking any overwrought drama out of the soap opera-worthy storylines; the cool absence of emotion is, remarkably, delightful. Rieger just tell it like it is, tongue firmly in cheek. It's not a perfect book. Most notably, the Five Famous... Falkes are faintly ridiculous two-dimensional stereotypes. To be honest, I still can't tell you which one Tom is. (The trumpet player? The nice one? Or is that Will? There IS a Tom, right?) I didn't care enough about them to keep the characters straight, not did I particularly want to hang out with any of them. I definitely didn't want to hang out with oldest-child Harry. But Eleanor and Rupert — and their marriage — are endlessly fascinating. I loved that no one really understands Eleanor, but no one can help but admire her. She reminds me of a warmer take on Clarissa Dalloway (a good thing, in my book). All in all, The Heirs is fun but smart — high-brow summer reading, the perfect pick for the beginning of summer break. Recommended! My former boss once interviewed Salman Rushdie. She's met hundreds of prominent people over her career, and she said he stuck out as a favorite because he was both brilliant and generous. For this, and also because it is ubiquitous in Books You Have to Read lists, I once packed Midnight's Children as my only reading option on an intercontinental plane ride. I ended up giving up about halfway through (it's a THICK book!). I found the writing brilliant, yes, but not really that generous — in fact, it almost read as if it were a vehicle to display Rushdie's brilliance, and that's why the book is so long. Actually, the truth may also just be that I'm not bright enough (or patient enough) to enjoy Rushdie's brilliance (I once also ditched the almost universally-lauded Wolf Hall mere chapters from the end, so I am serious when I say this is the likely explanation). For this reason, I was nervous to request an advanced review copy of The Golden Hour. I was afraid I'd have a hard time finishing it. But the blurb said this book is a scathing commentary on today's political and cultural climate (my paraphrase), so I was intrigued. (Also, I felt the need to finish a Rushdie sooner rather than later.) This time, I plowed through the book during a cross-country road trip. I finished in a few days — and I enjoyed it! The Golden House is about privileged family, Nero Golden and his three grown sons. The Goldens are remarkable because of their wealth (they own a mansion in a private New York City neighborhood), but also because they suddenly appear in New York with nary a backstory. In fact, they are intent on obscuring their shared family history — we don't even know their real names or their country of origin. We are made privy to this family's secrets by a Nick Caraway-esque narrator, who initially tells us his job is to observe, but, of course, gets himself inextricably tied to each family member's fate all the way to the bitter end. The narrator, who gives himself a pseudonym (Rene — take a guess as to why a pseudonym is necessary), almost immediately excuses his obsession with the family by claiming he is writing a screenplay in which they are the subjects. And thus begins the tale. What I liked about this book: Rushdie is not shy when using foreshadowing (is it foreshadowing if he tells us outright that something bad is going to happen? ), but it worked for me. I genuinely wanted to know what would happen next, especially once Rene gets more directly involved. I also enjoyed the hyper-currentness of the piece, which I'm not sure I've ever experienced in a novel— Rushdie takes us all the way past Trump's victory to 2017. The way he paints the most recent election is fascinating and disturbing (Trump's character is The Joker, Clinton is Batgirl) — I was acutely aware of just how farcical real life seems right now. Rushdie also dips into a multitude of worlds within his narrative — we hear about the art scene in New York City, Indian mob culture, even the inner-thoughts of a Russian gold-digger. And the writing? It's clear as a neon sign that Rushdie is brilliant. Surprise, surprise. That brilliance is maybe my biggest beef with the book. Rushdie, like in Midnight's Children, is too smart for me — he drops names (and all manner of trivia, in various languages) with reckless abandon. He also has such a strong voice, which is excellent, except every character sounds like they are various versions of the same voice. (No one, including the younger characters, sounds like they actually live in current day New York City.) In fact, the setting is confusing — it's supposed to be now, in a world I recognize, but the portrayal of actual events is so stylized, it could be of any made-up place, in any made-up time. (I'm thinking now that perhaps that was the point!) The actual plot centering on the Goldens almost feels anachronistic. I found it jarring when there are current-day references — oh yeah, this is supposed to be happening in my world. By now, this is sounding like a negative review. On the contrary, I quite liked this book and would recommend it. The plotting was, at times, delicious and Rushdie gives nice, satisfying pay-offs. (I found it terribly unfair but quite enjoyable that one character gets to have his cake and eat it, too.) Suffice it to say, The Golden Hour has made me want to give Midnight's Children another shot. I received this book from Net Galley in exchange for this review. All opinions are my own.